Participants have to upload a photo to www.clarins.com and submit their particulars. The photo should feature the full facial features of the participant to qualify for the contest. All photos will be reviewed and approved by Clarins Sdn Bhd before they are published on www.clarins.com and www.facebook.com/ClarinsMalaysia. Participants will be notified within 3 working days from the day of submission. Top 5 Grand Prizes will be awarded based on the highest number of Facebook “Likes”. 50 Consolation Prizes will be awarded to participants ranked from 6th -55th of Facebook “Likes”. 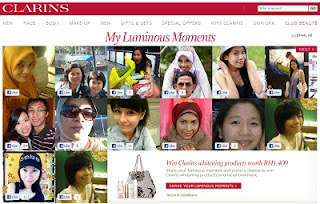 Visit Clarins : My Luminous Moments contests website for more detail. Btw, find out how you can redeem a FREE Clarins White Plus HP sample here! You celebrated Valentine's on the 14th? Nooo!!! 18th is the new Valentine's Day!